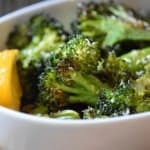 Home » Side-Dish and Vegetables » Oven Roasted Broccoli -A Great Side Dish! My kids may be all grown up now, but I remember what it was like raising them and being a working mom like it was yesterday. Some nights, with working late, traffic, helping them with homework, etc. etc. etc., preparing great dinners for us all was just about the last thing on me and my husband’s mind. That’s why it was so great to have this oven roasted broccoli recipe to fall back on whenever the hectic-level got completely maxed out! This broccoli recipe was great for my family when the kids were young – not only was it super quick and super easy to prepare, with minimal ingredients and minimal prep time – it also is very nutritious! I would often rotate between oven roasted broccoli, this recipe for Oven Roasted Garlic Brussel Sprouts and one of my favorites, this Easy Sheet Pan Oven Roasted Root Vegetables. Giving my family a powerhouse healthy food like broccoli, even at the busiest times, was a point of pride for me… and now it can be for all of you busy parents, too. What do I need to make Oven Roasted Broccoli? Olive oil. An Italian staple. Salt and pepper. To taste. Lemon juice. For that squirt of freshness. Pecorino romano or Parmesan cheese. This is optional but it just makes everything taste better, doesn’t it? As far as kitchen accessories are concerned, you will need a chopping board, a knife, a roasting pan, and some kitchen tongs. Toss the trimmed raw broccoli with olive oil, salt, pepper, and garlic. Make sure the surface of the entire broccoli is evenly-coated for the best results. Now, that’s typically all that I use, but you could add practically any herb or spice that you like! I find that these oven roasted broccoli are like a blank canvas (if blank canvases were green 🙂 ) what you do with them is really up to you. When you’re ready, spread your broccoli over a sheet pan or cast iron pan. It’s important to make sure all your broccoli is in a single layer, no matter what kind of pan you use. A general rule of thumb for roasting any vegetable, including these oven roasted broccoli, is to roast until the ends are brown. This usually takes about 15-20 minutes in an oven set at 425 degrees F.
Then, pull them out of the oven and drizzle with about one tablespoon of olive oil and give them a little squirt of lemon juice. Don’t skip this step – the lemon juice does a fabulous job of bringing all of the other flavors out. If you like, you can also sprinkle some Parmesan over the tops. And… that’s it! 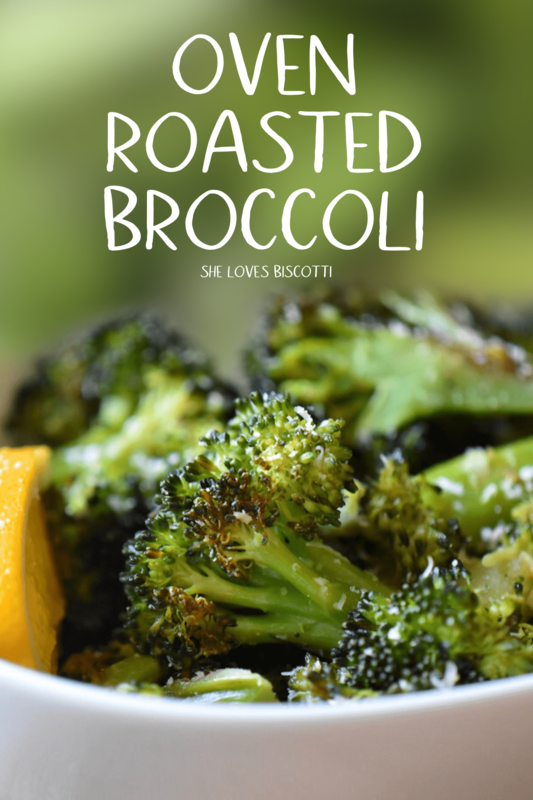 A simple, delicious, and healthy side-dish, I’m sure this Oven Roasted Broccoli Recipe will quickly become a family favorite in your home, as it did in mine. Trim the broccoli florets into bite sized pieces so that there is plenty of surface area for the broccoli to caramelize. Make sure to use a large pan and place the broccoli in a single layer, no overcrowding. What temperature do you use for oven roasted broccoli? You really do need to set your oven to 425° F. Roasting vegetables caramelizes the sugar found in them naturally, bringing out their natural sweetness and nuttiness. It’s really a different flavor experience, and I encourage you to try it out if you haven’t before! What vegetables are best roasted? As was mentioned, root vegetables like carrots and beets, and crucifers like cauliflower. are great when roasted. Other vegetables that taste great are any kind of squash, like acorn squash and butternut squash (my recipe for Roasted Butternut Squash Ginger Pear Soup makes special use of roasted squash!). As I have implied above, this recipe for oven roasted broccoli was a family favorite when my kids were growing up. Having such a reliable recipe to fall back on during the busy nights meant that I had more space in my brain to be mentally present during family dinners. And that led to some truly cherished memories of sharing meals with my kids. 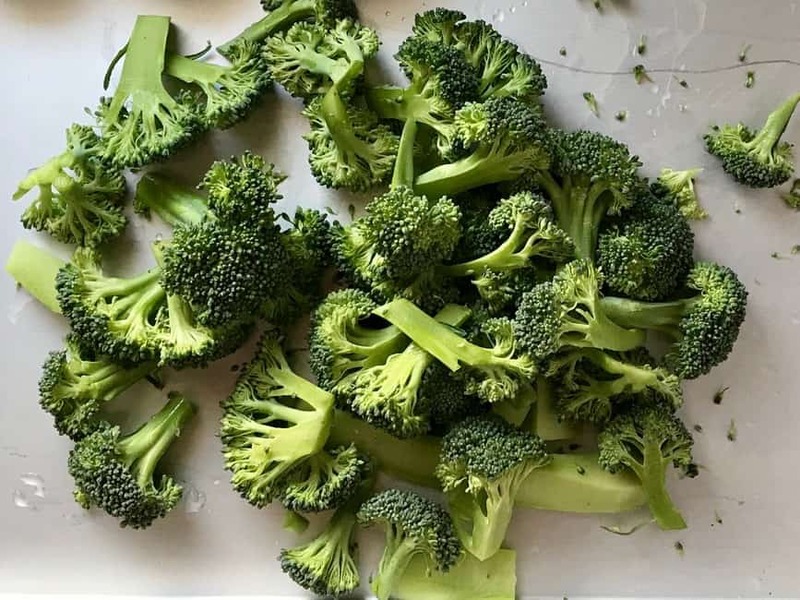 Broccoli, as I’m sure you’re well-aware, is a super-food too, chock full of vitamins and minerals, and generally one of the healthiest foods around! 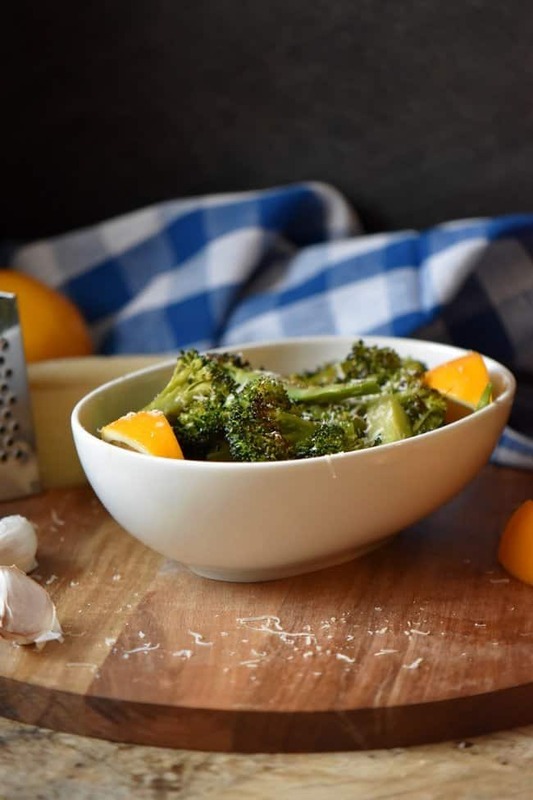 It almost feels like cheating to have raised two kids with this quick and easy oven roasted broccoli recipe – preparing a delicious, crowd-pleasing broccoli recipe in only a few minutes, and having it be crazy-healthy too? I adapted this Oven Roasted Broccoli Recipe from this recipe. Naturally, I increased the amounts of both garlic and olive oil used in the recipe. I also increased the temperature of the oven. I have been making this oven roasted broccoli for over a decade, and I think I’ll be making it for many decades to come. Nothing beats the simplicity and the taste of this Oven Roasted Broccoli; if you don’t believe me, try it for yourself! ★★★★★ If you have made this Oven Roasted Broccoli recipe, I would love to hear about it in the comments below and be sure to rate the recipe! If you’re in search of a great and easy-to-prepare broccoli recipe for those busy weeknight dinners, look no further. This Oven Roasted Broccoli is exactly what you’re looking for! Preheat oven to 425 F (220 C). Place oven rack in the middle. Cut broccoli into florets. If florets are large, cut in half. Drizzle the broccoli with the olive oil; make sure to evenly coat the broccoli. Add the salt, pepper and garlic. Toss together. Spread the broccoli on a sheet pan large enough to accommodate in a single layer. Roast in a preheated oven for about 15-20 minutes or until the ends begin to brown. 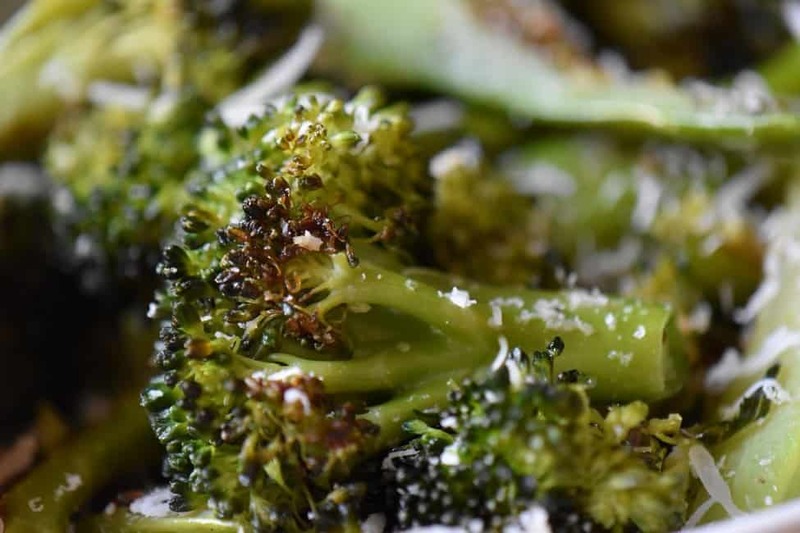 Remove the broccoli form the oven and immediately drizzle with remaining tablespoon of olive oil and lemon juice (If using, can sprinkle grated cheese over the tops). An absolute life saver during a busy week, an so delicious. We eat a lot of roasted veggies, but broccoli isn’t a veggie I Roast very often. I’ll gave to give this recipe a try. I love that it has few ingredients, making it an easy side for busy evenings. It sounds delicious! I love these simple, single-vegetable recipes! Your tip for adding lemon juice at the end is a great one! I’m going to try this. I have always been a great fan of broccoli. Not only are they so good for you, they are also delicious especially prepared this way. I will try your recipe. Baci! Yum! I love roasted broccoli, still trying to convince my daughter but the added garlic and lemon may convince her.! I love roasted broccoli. The addition of the lemon and cheese is brilliant. I usually just do a bit of olive oil. I’m definitely doing this next time! We’re fans of roasting vegetables in our nest too, especially cauliflower smoothered in sumac…happy roasting! Roasting vegetables is so easy and delicious. I don’t know why it took so long for them to be popular. It’s a drastic change from the overcooked, mushy vegetables of the past!